You’ve heard it many times. “The purchase of a home is one of the most important decisions you’ll make in your lifetime.” In today’s market, selling a home is equally important—getting the most out of your investment. So whether buying or selling, you want a specialist—a residential specialist. Someone who understands the complexities of the housing market, how to best position your interests, and someone who will get to know you and what you want from the transaction. You want success. You want a Certified Residential Specialist. Certified Residential Specialist (CRS) agents have proven record of success—3X success, in fact. Compared to the average REALTOR®, CRS agents have been in the business nearly three times longer, have three times the number of annual transactions, and generate three times the amount of gross sales. There’s no coincidence when it comes to CRS success. CRS agents must meet stringent education and experience requirements. That’s why only 3% of REALTORS® are Certified Residential Specialists. CRS agents are dedicated professionals. They work to ensure success for their home-buying and selling clients by tapping into their superior training, exceptional professional referral network, and timely and cutting edge industry resources. 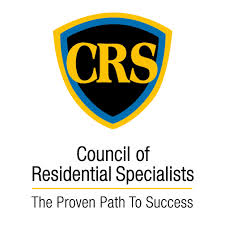 CRS agents made the right choice when deciding to become a Certified Residential Specialist. Now it’s your turn. Make your first home-buying or selling decision be to work with a member of the Council of Certified Residential Specialists.